Modelling the Old Midland Station. The idea to build the Olney railway station and yard had been voiced for some years, but was raised again at the club AGM in January 2011. A special general meeting of the club to discuss the possibility of a project was convened in March 2011. The scale decided on was OO gauge. We would need to keep something moving to stimulate exhibition interest, implying a loop round layout. 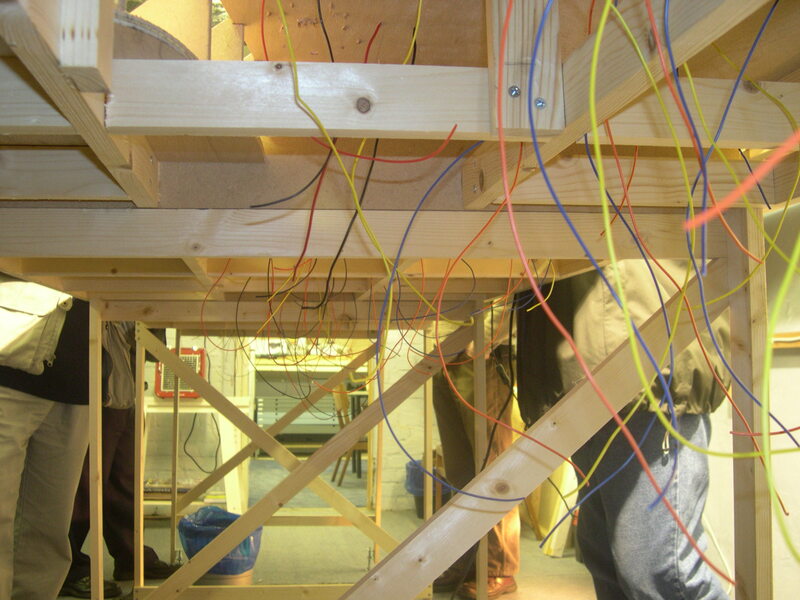 In the Olney context we would need three operators on at a time, needing up to six people travelling to exhibitions. It was agreed to carry on with the American N gauge project, to run at the same time as the Olney station project. A detailed study of the cost of new modelling equipment, materials, tools, boards, points, track, rolling stock and scenery, was required. The meeting agreed, after some discussion, to adopt the Olney project in OO gauge. Some people thought the project too big to undertake. That meeting also agreed that small workshops could be held in the basic techniques of baseboards, electrics and scenery. 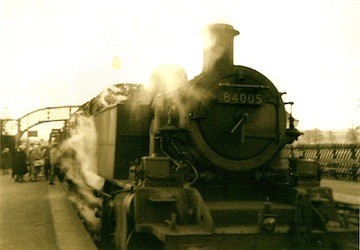 Throughout the summer research was carried out on the Northampton to Bedford line and stations, before and after closure to passengers in 1962. Photographs and maps were borrowed and copied. There was an invitation to visit Piddington railway station (now a private residence), which many members attended and enjoyed. We saw some of the owner's photograph collection and had a look at the buildings on and around the old platform. We were also able to walk along the old track bed and to take photographs, all of which gave us a feel of what the Olney station would have been like. 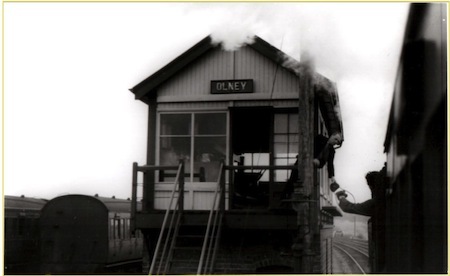 Below is a potted history of the Station at Olney. Barrie has researched the subject extensively and has written an excellent article bringing together all the available information. I recommend that everyone read it. Olney station was opened by the Bedford & Northampton Railway on 10 June 1872 as part of its Bedford to Northampton Line. This company was absorbed by the Midland Railway on 16 June 1885. 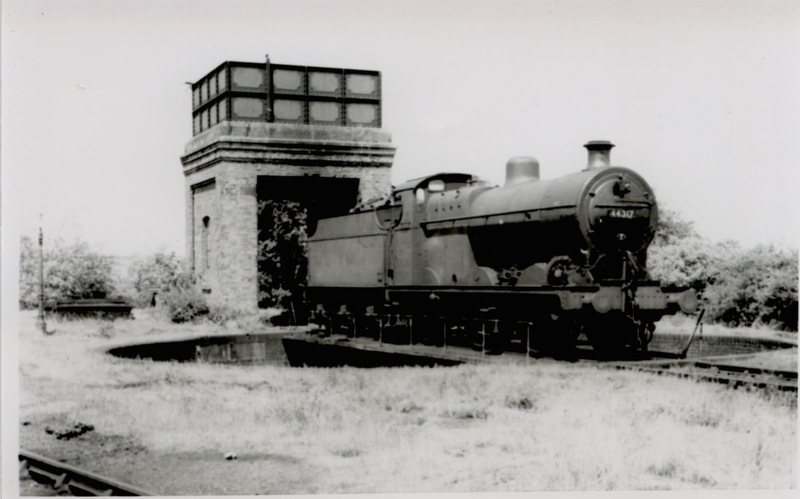 An imposing station building was constructed at Olney, together with an engine shed equipped with a water tank supplied with water from the nearby River Great Ouse. 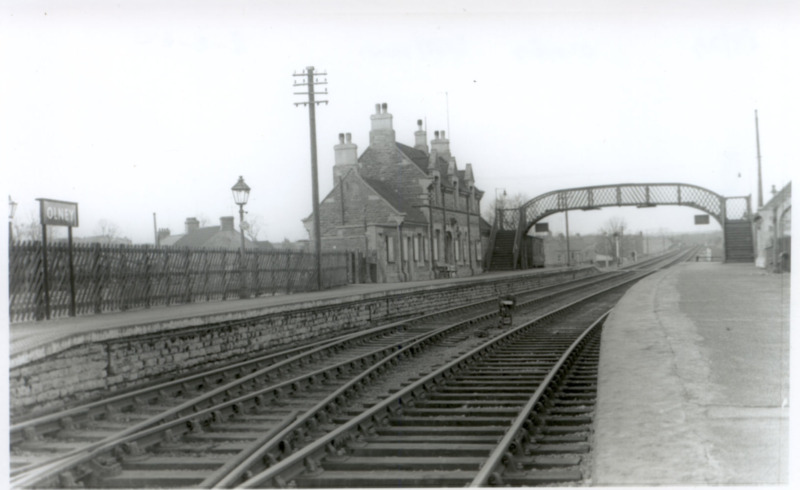 By an agreement concluded on 18 April 1889 with the Stratford-upon-Avon and Midland Junction Railway (SMJR), the Midland Railway (MR) granted the SMJR running rights over its line from Ravenstone Wood Junction to Olney, including the right to use Olney station and its facilities. 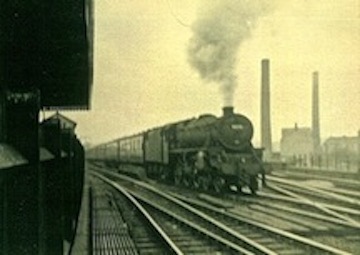 A joint committee was subsequently set up to allow the MR and SMJR to run their respective lines as one single line, creating a 55.5 miles (89.3 km) route connecting St Pancras to Bristol. The first joint service, a goods train, ran on 13 April 1891. Olney became important as the terminus of SMJR freight operations from Broom and the west. 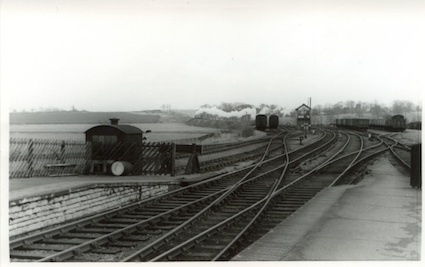 Extra sidings were laid to accommodate the traffic generated, as the SMJR only had running powers over the MR as far as Olney. 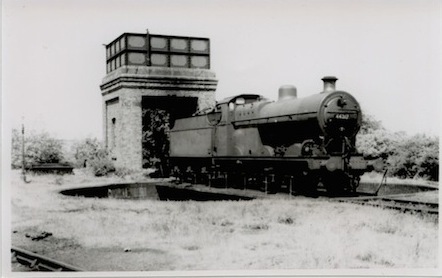 SMJR locomotives had to be turned at Olney by a turntable. Following the grouping of 1923, the SMJR and MR became part of the London, Midland and Scottish Railway which, in 1927, re-introduced passenger services between Olney and Towcester in the form of excursion trains on Towcester race days. 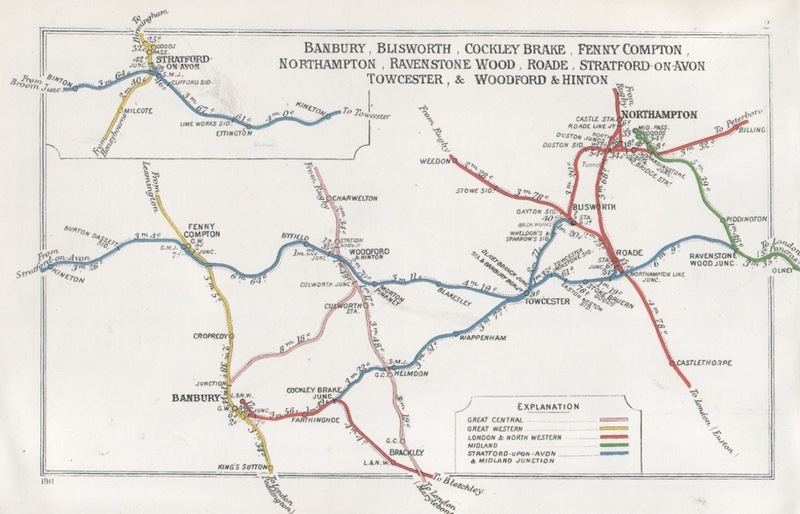 Post nationalisation, the various routes from Olney began to close, beginning with Banbury to Towcester on 30 June 1951 and Blisworth to Stratford on 7 April 1952. 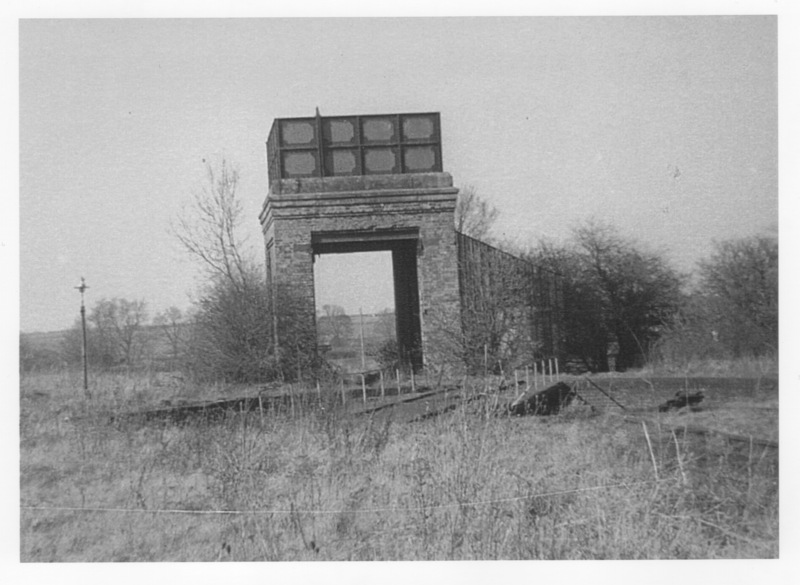 The line between Towcester and Ravenstone Wood junction, still heavily used by steel and ironstone traffic from South Wales and north-east England, closed in June 1958, because of the construction of the M1 motorway. 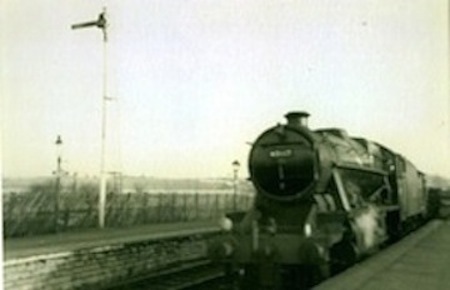 Olney station lasted six more years, passenger services being withdrawn in 1962 and the goods yard closing two years later. 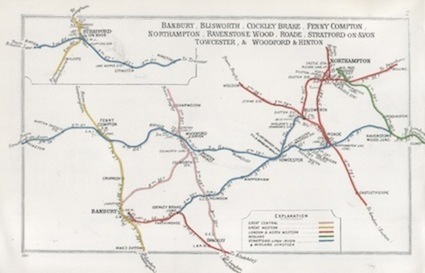 Map showing routes West of Olney pre the grouping of 1923. Click for a larger view. 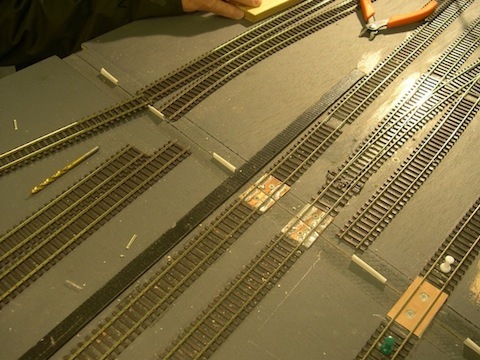 Following the success - and lessons learnt - from the construction of the "Bridge End" layout, the new layout should be in OO gauge fine scale format and aimed to be of exhibition standard. The drawing suggests a continuous double track circuit layout, each track [up and down]capable of being operated independently [two separate layouts] with fiddleyards. The resulting overall dimensions are 20 ft x 9 ft. This has clear implications on the space available within the club room, but the layout could be built in stages of a minimum two boards at a time. Eg boards 1&2, 2&3, 3&4 and so on, ensuring that connections [track and electrics] are functioning between boards. Substance with simplicity is the key. 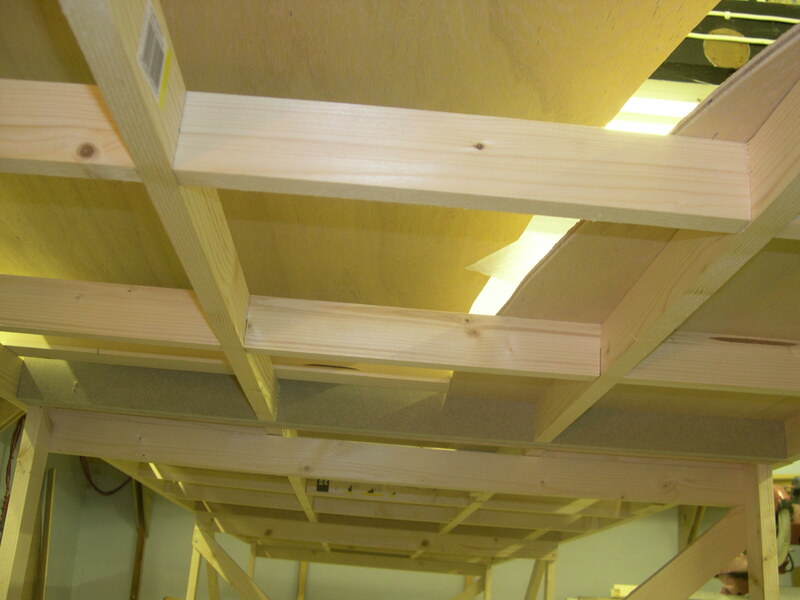 Baseboards as already undertaken in previous layouts, but with an underframing such as B&Q trestles should be considered. The time required to construct such a layout should not be underestimated. With the relatively modest manpower on hand and the limited level of hours per week, we are looking at two years or more. A target date [eg an exhibition] should be considered and a programme of works prepared - although this will doubtless be adjusted as time goes by. Hopefully the Club funds will meet this, the most expensive elements being baseboards, trackwork and electrics. This can be spread over the construction period - related to the programme and progress. This will require a commitment on the part of club members', but continuing reporting of progress in the local Press may prove fruitful. On the basis of two separate layouts, two operators would be required to work in the fiddle yard plus others active on "front of stage". The opportunity to take control at the front eg shunting movements, should also be considered. This is a significant challenge to the Club and success could bring enhancement of reputation in the modelling world. At the same time, such success would bring a commitment if invitations to exhibit elsewhere materialise. In practical terms, the question of dismantling / re-erection and transporting to "where ever" needs consideration. The WIN RAIL computer design programme was used to start the detailed layout of the track and tables. With the help of maps, photographs and local knowledge, the piecing together of the the station and goods yard is underway. A paper scale drawing of the proposed layout was on display at the Club's exhibition in September 2012. It was decided that DCC will be used to power the Track. The various systems will be evaluated for ease of use and value for money. Here are some of the photographs used to design the layout. Click on the photographs for a larger view. Turntable and water tank. The turntable could only take a 4F loco or smaller. Built of blue brick, it was turned manually. The water tower was built in red brick, with whitewash inside walls. The leather water hose was on the right, inside at the front. 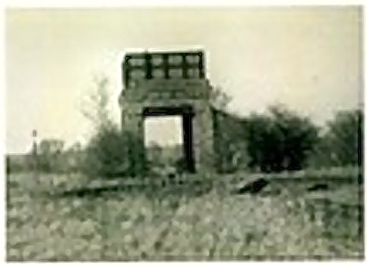 An inspection /ash pit ran the length, built of red brick with whitewash sides. The water tank was open top, holding 9,000 gallons. The outer framework was painted with black bitumen and the inside with red oxide paint. The stores lean to on the side was made from tongue and grove wooden boards, painted in black bitumen.and there was a Head shunt at the far end of the road. 45292 at Northampton Castle with ECS from Olney - October 1961. 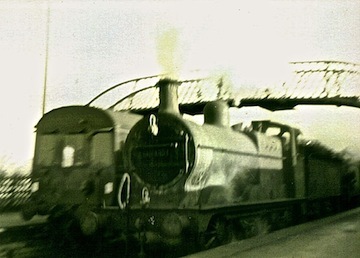 84005 at Olney with the 11.58am to Northampton Castle - December 1961. 43449 at Olney with the Pick-Up goods - August 1961. 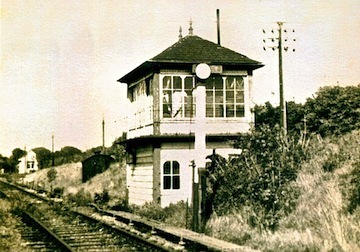 Turvey signal box prior to demolition, taken on 22 January 1965. 84006 taking the tablet at Olney Signal Box, 15 February 1962. 48117 reversing into Olney West Yard with a Saturday afternoon prefab train in 1964. All the photographs shown are reproduced by kind permission of Alan Beresford. The baseboard and track construction are now under way. Each of the five baseboards has been constructed, using 2 inches x 1 inch planed timber and good quality plywood for the track base. 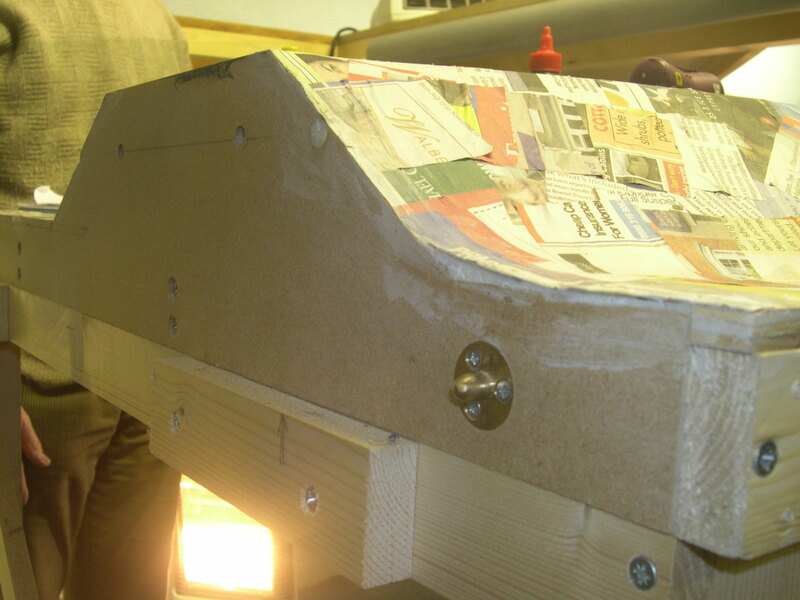 Showing the end board made from MDF with one part of the pattern makers dowel. The end boards for table one North end and table two South end were clamped together, cut to shape and a pillar drill was used to drill the holes for the pattern makers dowel. This was repeated for the other pairs of table end. The club held a review of the Olney Station Project's progress in early February 2014 and mapped out the way forward. A decision was taken that Peco code 75 track and electro frog points would be used instead of the fine scale originally planned. 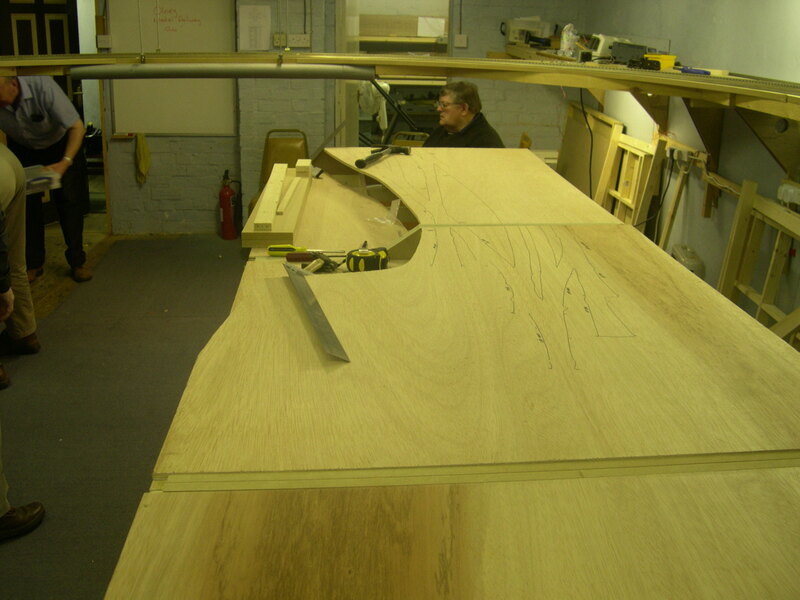 The table joining system was modified from the original plan, using metal pattern makers dowels, with the new end boards drilled using a pillar drill to achieve greater accuracy. Work progressed on laying out the track ready for the construction of the raised area. An extension frame was constructed to stop the points from straddling two tables. The type of point motor had been discussed, with the SEEP solenoid type being preferred, mainly because there are twenty or so in stock and also because Don had already made a printed circuit board (pcb). The board had two micro switches mounted on the assembly, to operate the electro frog and also to operate Light Emitting Diodes for use on a mimic panel, to indicate the point setting position. The pcb, micro switches and motor had been used on the St Peter's Yard layout, built in 2013 to explore DCC techniques. Don demonstrated a servo motor to operate points, using the Model Electronic Railway Groups CBUS control system, with a pcb to mount the servo and two microswitches, similar to his SEEP board. It was however, agreed to proceed with the SEEP motors until stocks ran out. Click on the photograph for a larger view. The view above shows the copper strengthening pieces used to take the tracks over table joins for portable layouts. The right hand side has not yet been cut. This is done with a saw using the temporary spacers to maintain the required gap, once the rails have been soldered to the copper. 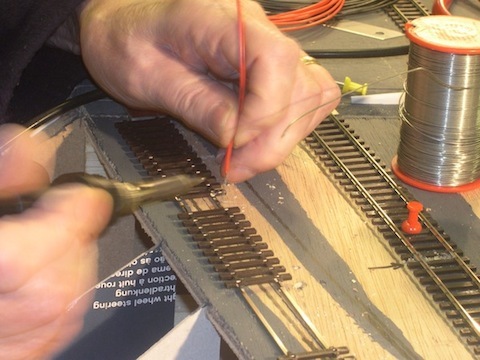 A groove is cut along the length of the copper to provide electrical isolation between the tracks before it is screwed down, making sure the screws do not bridge the gap. View of the main lines and the sidings taken from the station end. Soldering dropper wires on to the bottom of each rail. All the track sections have dropper wires soldered to the bottom of the rails. There are two circuits, on the left red and black and on the right blue and orange. The yellow wires are connected to the point frogs or dividing centre. The support pieces for the high level board can also be seen. 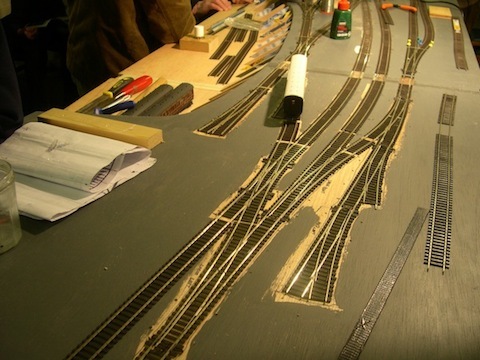 The DCC system chosen to power the track was the NCE system, using 5 ampere power boxes and hand held controllers. The system is flexible, allowing for further controllers and power boxes to be added easily as the layout is expanded and money becomes available. It has also been agreed to use the Model Electronic Railway Group (MERG) CBUS system to control the points (Turnouts), Mimic board and point operating switches. This will greatly reduce the number of wires going between the boards. The two double slip points and the two 3-way points installed so far will not operate the microswitches associated with the SEEP motors. The problem with the double slips has been identified as half the blade travel of a standard point (switch) and it was decided that the solenoid point motors driving them should be replaced by servo motors. Similarly with the three way points, the travel is less than the standard point. Servo motors are able to cope with the smaller travel of the double slips and three way points. Position indicators for Frog switching and mimic panel lamps can be handled electronically by the Model Electronic Railway Group (MERG) servo control board. This gets over the need for micro-switches. Six servo control boards have been purchased from the Model Electronic Railway Group (MERG) and assembled. Don has designed a method of mounting the servo motors to the Peco points, using aluminium channel and has also constructed an eight way, four way and two way 12volt relay printed circuit board. The signal to operate a relay is produced by the servo control board as the servo moves through its centre point. Using a further MERG board that switches eight individual 12 volt supplies, we can now use this produced servo event to operate the relay, which will switch the frog polarity. Any spare channels could be used to provide lighting etc, switchable from the main control panel. The same produced event is also used to light the route lamps on the mimic panel. Spare servo drive board positions could be used to operate rolling stock uncoupling ramps, using some of the spare switches on the control panel. The servo drive board can operate up to eight servo motors and the relay drive board is able to drive up to eight relays, or other 12volt low current devices. Lots of flexibility. N.B. The servo control board has the option of 5volt power to drive the servo motors being taken either externally or from the board supply driving its electronics. The internal option is fine for initial set up and testing up to four motors, but for more than five motors per board, or using multiple boards the initial current surge on switch on drops the voltage, disabling the electronics. The external option from a separate 5volt supply is therefore recommended. This page was last updated on 10 September 2017. © Olney Model Railway Club 2018. All rights reserved.